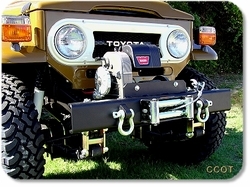 "Hell for Stout" are the Best Looking, overbuilt "H" style Shackles on the Market. 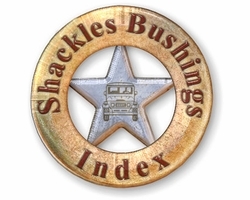 Quality and fit is number one with these Heavy Duty Shackles. 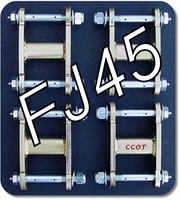 Shackles built from 3/8" thick side plates with a precision welded "C" channel for superior strength. 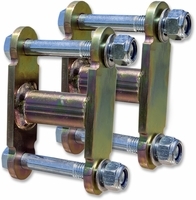 Shackles come with Heavy Duty Cross Bolts and "Nylock" Nuts. 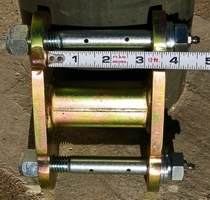 "Hell for Stout" Shackles are available in two sizes. 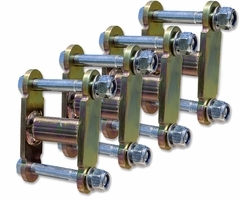 1-1/2" higher than stock and 2-1/2" higher than stock. 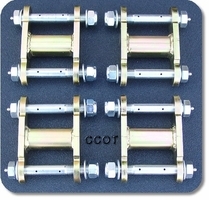 Yellow Zinc Plated. 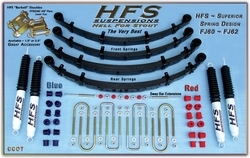 Barbell Shackles fit Toyota Springs, HFS Springs as well as many other popular Springs with stock size Spring eyes. 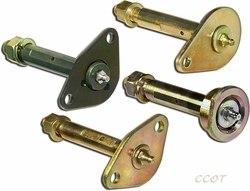 Do not over tighten "nylock" nuts to bend or pinch "H" style shackle side plates. 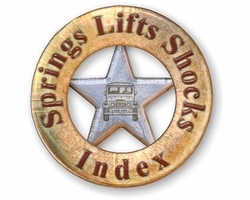 Pictured vehicle features 33" x 12.5" tires. Best Looking Shackle on the Market! 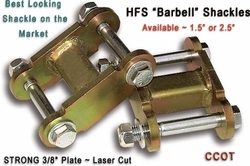 STRONG 3/8" Barbell Side Plate is Laser Cut! Ultra High Quality with the BEST LOOKING Profile! Barbell Side Plate is Laser Cut! 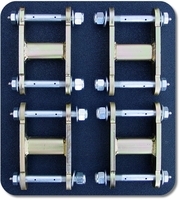 Note: Do not over tighten to bend side plates. Shackle Barbell HFS FJ40 Series inside width 3 1/4"
Greasable Gun-drilled bolts, zerks and nylock nuts. 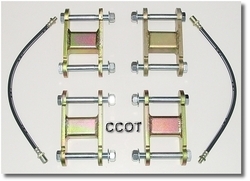 Tech Tip: Do not over tighten bolts & bend side plates. Grease Bolts complete with zerks & nylock nuts. Installation: Nyloc nuts should be installed just snug tight to shackles. 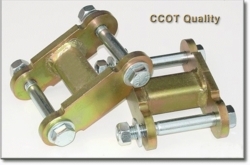 Depending on your shackle style, additional torgue to nyloc nut could bend your shackle. 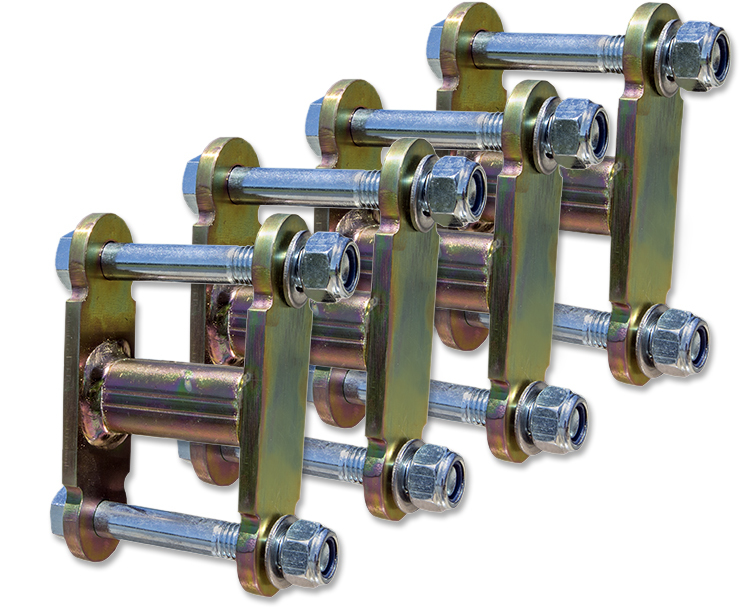 Note: System will add $32 to base price for set of 8 bolts. 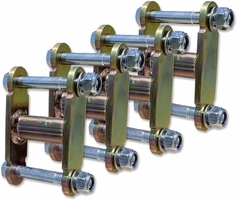 Note: System will add $45 to base price for set of 8 bolts. 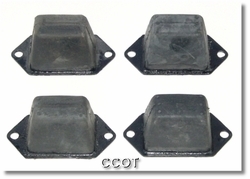 High Quality Poly Bushings, Click.